In recent weeks, the Trump administration’s cruel policy of separating children from their parents who are detained at the U.S.-Mexico border dominated news headlines. 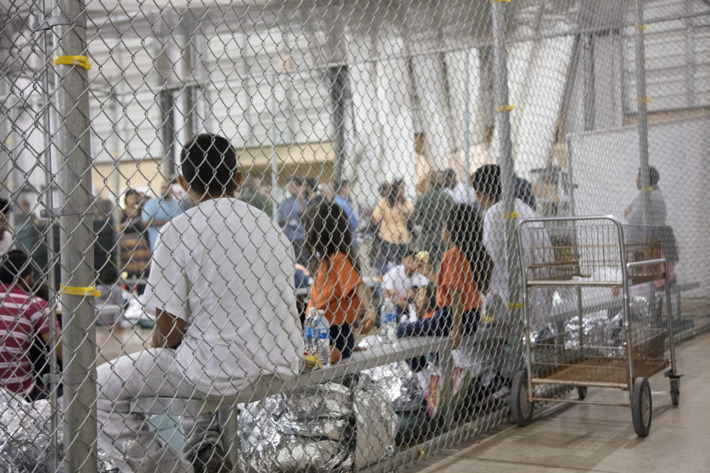 Disturbing images and audio clips from processing centers and shelters housing children generated mass outrage among millions of people and numerous elected officials. While the Trump administration officially ended its policy of family separation, families will remain in detention indefinitely. Against this backdrop, there is a growing chorus to abolish the the Immigration and Customs Enforcement (ICE) agency. In Pennsylvania, there have been renewed calls to shut down the Berks County Detention Center, a prison for immigrant families. This weekend, demonstrators in more than 700 locations called for the reunification of immigrant families separated at the border, as well as an end to the policies that cause those separations. There has been also been increasing concern over who exactly has been profiting from the policies that incarcerate immigrant families. Who are the companies, investors, banks, and top executives that stand to make money – or are already profiting – off of the zero tolerance and family separation and indefinite detention policies? And more importantly, can they be pressured to end their complicity with and enabling of Trump’s inhumane immigration policies? Geo Group and CoreCivic, the private prison companies who are central to Trump’s immigration policies, have a significant footprint in Pennsylvania. Geo and CoreCivic operate 21 and three facilities in the state, respectively. Pat Toomey was also the 3rd biggest recipient of Geo Group cash in 2016. Wells Fargo, which finances and invests in private prison companies, is one of the biggest banks in the Philadelphia-area, with numerous bank branches and, of course, an arena named for it. Money manager giant Vanguard, based in Malvern, PA, is currently the biggest shareholder in both Geo Group and CoreCivic, with a 15.4% and 15.01% stake, respectively, according to the most recently available filings. Two Philadelphia companies, Comcast and Team Sports Planet, have had contracts with ICE under their Detention Compliance and Removals unit. Comcast currently has at least two active contracts with ICE. Microsoft, which has a $19.4 million contract with ICE for processing data and artificial intelligence capabilities, has a major campus in Malvern, PA.
Head to the bottom of the article for the contact information for these organizations or print out a .pdf here. GEO Group and CoreCivic, which both have facilities in Pennsylvania, are the world’s largest private prison companies; they gave $250,000 and $475,000 to Trump’s campaign and inauguration, respectively. Now, they are ready to reap their rewards. Both companies stand to make a windfall from Trump’s zero tolerance policy that is pushing thousands of immigrants into detention facilities. As of March, private prison companies ran 71% of immigrant detention beds. Geo Group runs 11 immigrant processing centers around the country, including one of the country’s three immigrant family detention centers in Karnes County, Texas. CoreCivic runs eight, including an immigrant family detention center in Dilley, Texas. The continuation of zero-tolerance and implementation of indefinite family detention will require the buildout of significant additional detention facilities and infrastructure, and though it it not clear how this will play out, GEO Group and CoreCivic will likely be key players. Two days after Trump issued his executive order that ended family separation to detain families together, the Department of Homeland Security posted a request for information on the cost of adding up to 15,000 beds to detain families. These beds will almost certainly be run by private prison companies. Geo Group operates over 20 facilities in Pennsylvania, including George W. Hill Correctional Facility in Glen Mills, PA and two residential reentry facilities in Philadelphia. CoreCivic operates three facilities in Philadelphia and one in Chester, PA. Additionally, according to the Center for Responsive Politics, Senator Pat Toomey was the third largest recipient of Geo Group cash in 2016, accepting $21,305 from the corporation. A slew of big banks--including scandal-ridden Wells Fargo, with which Philadelphia ended its payroll contract last year-- finance the companies that profit from immigrant and family detention and profit, in turn, from these lucrative lending arrangements. The credit these banks extend to these companies will be especially important as they look to continue growing their operations under Trump’s zero-tolerance and family detention policies. Additionally, these financial institutions – as well as large money managers like Vanguard – are also significant investors in the stock of publicly-held corporations. The Wells Fargo Center is home of the 76ers and the Flyers and was named for ICE collaborator and financier Wells Fargo. GEO Group and CoreCivic, the two largest private prison operators, are major profiteers off of immigration detention. A 2016 report from In The Public Interest identified six banks as the primary financiers of GEO and CoreCivic. They are: Bank of America, JPMorgan Chase, BNP Paribas, SunTrust, U.S. Bancorp, and Wells Fargo. As of 2016, both companies had $900 million in lines of credit from this consortium of banks. It’s also important to note that GEO Group and CoreCivic are structured as Real Estate Investment Trusts (REITs), which allows them to pay very low taxes - GEO paid only $1.5 million in Federal taxes in 2015 - while giving 90% of their taxable income to shareholders. As a result of this structure these companies have limited cash reserves and rely wholly on these banks to extend credit to keep their operations going. Simply put, if the banks rescinded their credit agreements these companies would struggle to continue being operational. In the past, Wells Fargo has been one of the top shareholders in GEO, and the bank still has over $16 million invested in CoreCivic and $10 million invested in GEO Group. Money-managing giant The Vanguard Group is headquartered in Malvern, PA. Amongst its $5.1 trillion in global assets under management are significant investments in both Geo Group and CoreCivic. In fact, Vanguard is the biggest shareholder in both Geo and CoreCivic, owning slightly bigger stakes in the companies than fellow money-manager Blackrock. According to the most recently available filings, Vanguard owns a 15.4% stake in Geo Group and a 15.01% stake in CoreCivic, worth $392 million and $347 million, respectively. Trump’s family separation policy has also brought increased public scrutiny to U.S. Immigration and Customs Enforcement (ICE)--and the companies that help the agency carry out its mission. A handful of progressive candidates, including New York candidate for Governor Cynthia Nixon, have called for ICE to be abolished. Tech companies including Microsoft, Motorola Solutions, Hewlett Packard Enterprise, and Palantir are being criticized for the millions of dollars worth of contracts they hold with ICE to help the agency carry out deportations. Last week, employees at Microsoft and Amazon demanded the companies cut ties with ICE. According to USAspending.gov, businesses based in Philadelphia have been contracting with ICE since 2009. 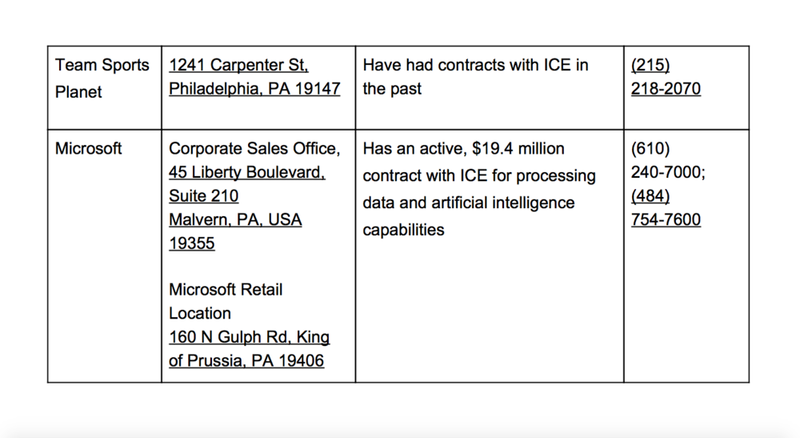 18 of these contracts are itemized as “detention compliance and removals.” The City of Philadelphia, Comcast, and Team Sports Planet are among the vendors that work with ICE. Comcast appears to have provided cable and internet services for the agency, and has two active contracts with ICE--one set to expire in November of this year and one set to expire in August 2019, worth up to $4,800 and $11,551, respectively. Comcast has accepted contracts from ICE worth up to $73,000 since 2014. It is important to note that--especially when compared to other ICE contractors who routinely receive multi-million dollar contracts from the agency--Comcast’s contracts are quite small. But this means it would be easy for Comcast to say it will no longer do business with ICE. In the wake of this month’s public outcry over the Trump administration’s cruel policy of separating children from their parents who are detained at the U.S.-Mexico border, tech companies have come under scrutiny for their contracts with ICE. These companies provide a wide variety of hardware, services, and infrastructure to the agency, including: systems for tracking immigrants, mobile radio communications and tactical communications programs, and facial recognition software. Microsoft has a “technology center campus” (one of eleven across the country at the time it opened) in Malvern, PA.
Click here to download a full PDF of all major Philly-area ICE contractors with the services they perform for ice, their locations and phone numbers. You can also read through the list below.